On the left side of this image, we see Francis Gary Powers as he appeared during his testimony before Congress on March 6, 1962. On the right side, we see Rudolf Abel (Willy Fisher) wearing his distinctive dark hat with the white band. Online via TASS. On the 6th of March, 1962, Francis Gary Powers testified before the U.S. Senate Armed Services Committee. In a public hearing, the U-2 pilot explained what had happened to him on the day his plane was hit by a Soviet missile. He was cleared of any wrongdoing and received the pay he would have received but for his incarceration in the Soviet Union. 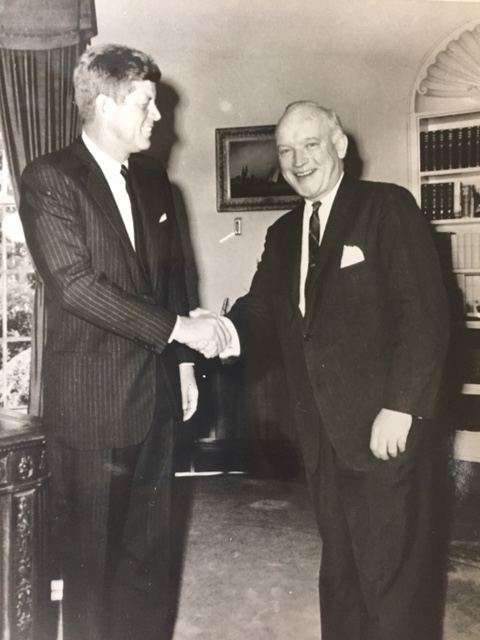 President Kennedy sent Jim Donovan a letter of thanks and personally met with him at the White House. Abel gave Donovan a gift of two rare books during the summer of 1962. He sent them - two 16th-century Latin editions, bound with vellum, of Commentaries on the Justinian Code - with a letter expressing his gratitude for everything Donovan had done for him. Negotiated - with Fidel Castro - the release of people captured during the failed Bay of Pigs invasion (in Cuba), including: 1,113 prisoners; about 8,500 other Cubans; more than 30 imprisoned Americans; 3 CIA agents. Francis Gary Powers worked at Lockheed for a time, as a test pilot, then flew helicopters for KNBC, a television station in Los Angeles. On the job, in 1977, Powers encountered difficulties with his chopper. He could have landed safely, but to do so would have potentially harmed people on the ground. Instead, he tried to land elsewhere, but the chopper crashed. Powers died in that crash, as did his colleague. Many years after Powers’ death, the U.S. Air Force Chief of Staff - General Norton Schwartz -posthumously awarded Captain Powers (his Air-Force rank) a Silver Star. The event took place at the Pentagon’s Hall of Heroes on the 15th of June, 2012. The Silver Star recognized Powers’ “exceptional loyalty” to his country while he endured harsh interrogation at Moscow’s Lubyanka Prison. The U-2 Incident had been extremely difficult for Powers’ family, too. His daughter Dee remembers an especially awful situation when she was in third grade. Beyond coping with what had happened to her father, and what people were saying about him - including intense criticism for not destroying his plane and being captured alive - her teacher made the comments personal. [A teacher told] the entire class that my father should have killed himself. What about Rudolf Abel? How did his life work-out after his walk across the Bridge of Spies? He was reunited with Yelena (his wife) and Evelyn (his daughter) soon after regaining his freedom on February 10, 1962. The family flew back to Russia together. Initially, Abel returned to the KGB working in the “Illegals Directorate.” He gave lectures, and visited with students, talking about what it takes to work in the intelligence service. Willy Fisher / Rudolf Abel lived until 1971. He was 69 years old when he died of lung cancer on the 15th of November that year. It was the anniversary of the very day—November 15, 1957—when Jim Donovan had successfully convinced the Judge to spare his client's life. In honor of his position, and the esteem in which he was held, his body lay in state at a KGB hall not far from the Lubyanka Prison. His remains were cremated, at the New Donskoy (Donskoi) Cemetery in Moscow, where his ashes are interred. After her husband's death, Yelena fought for a year to change the name on the stone which marks his gravesite. She wanted it to reflect his real, not his spy, name: William Genrikhovich Fisher. 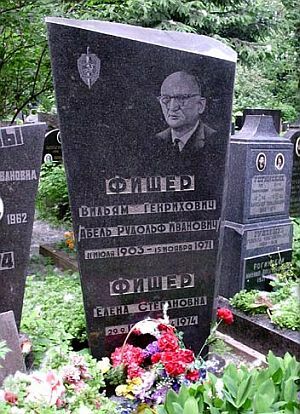 No one really knows, for sure, what Willy Fisher / Rudolf Abel actually accomplished as a Soviet spy living in America. One thing we do know, however. His walk across the Glienicke inaugurated that bridge's new nickname: "Bridge of Spies." Bos, Carole "DONOVAN, ABEL and POWERS after the BRIDGE OF SPIES" AwesomeStories.com. Sep 22, 2015. Apr 20, 2019. Bay of Pigs Invasion - A "Perfect Failure"